Rally Racer is top down racing arcade game with beautiful graphics and smooth gameplay. 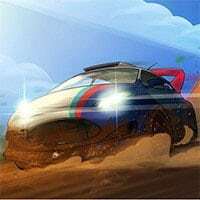 Also compatible on most mobile devices, Rally Racer features 12 competitive levels with opponents being much harder to beat each time you play on a higher level. Winning with the first place will grant you the three star rank for that level. Are you skilled enough to get all 36 stars? Or will you settle for the second place? Find out now! Hop inside your car and start your race in the dirt tracks in this awesome top-down racing game. Race against two other drivers in Rally Race Game! So step on the gas and drift away the sharp curves and continue to get the lead! You can play this game on all devices. Also make sure to check out Dirt Rally Driver HD Game, you may enjoy playing it.